Living Area: 1,245 sq. ft. Lot Size: 5,575 sq. ft. This property represents a tremendous opportunity for a homeowner who desires to live in a Cliff May designed home in the Rancho Estates, at a discounted price. 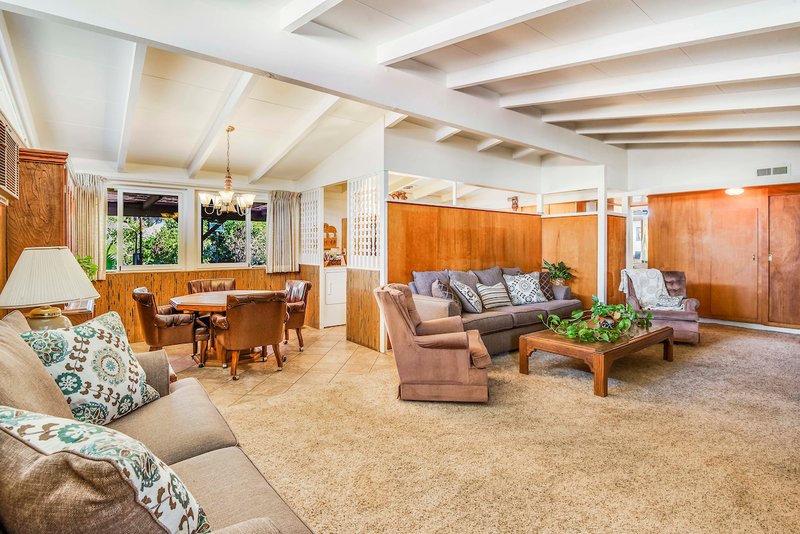 Built in 1954, this Rancho features three bedrooms, two bathrooms, a living room with fireplace, a dining area and a galley kitchen in 1,245 square feet of living space. The original birch paneling in the hall is in excellent condition, preserving the rich character of the home. The lot measures 5,575 square feet and features both a spacious and private front patio and yard, and a backyard. For the savvy buyer who is prepared to do some cosmetic work this property represents great value, especially when you consider that comparably sized homes in the neighborhood have sold recently for as high as $929,000. The Rancho Estates is an exceptional neighborhood characterized by tree-lined streets, midcentury modern architecture, great parks and a strong sense of community.